‘Black hole’: What makes Russia’s newest submarine unique? 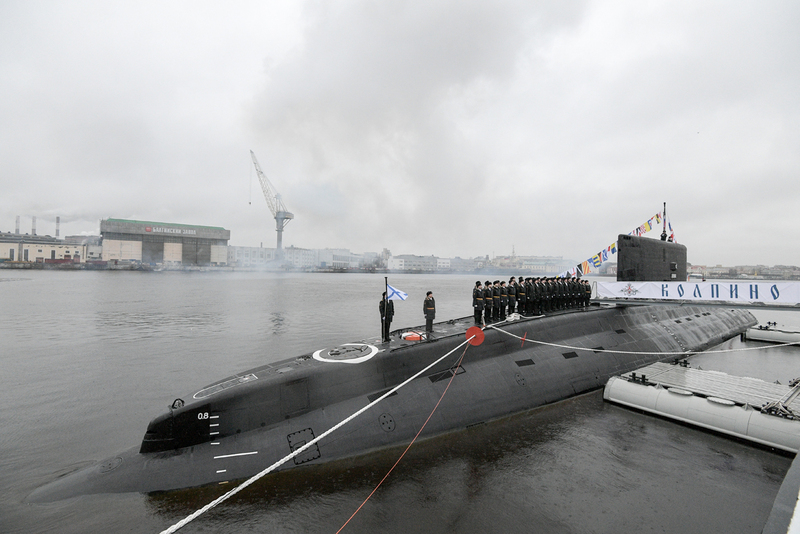 A ceremony to transfer the Kolpino submarine to the Russian Navy at the Admiralty Shipyards in St. Petersburg. The Project 636.3 submarine “Kolpino,” which will be stationed at the Russian Black Sea Fleet’s new base in Novorossiysk, is capable of detecting targets at a distance three to four times in excess of the capabilities of radar systems of a potential enemy, military experts say. The Russian defense industry has completed the construction of a diesel-electric submarine of Project 636.3, the Kolpino, for the Black Sea Fleet. The submarine, dubbed by NATO naval experts as the “Black Hole” for its stealth and underwater capabilities, is equipped with the newest Kalibr-PL cruise missiles with an effective range of up to 2,500 kilometers (1,550 miles). The submarine will be based at a new Russian naval base in the city of Novorossiysk in the Krasnodar Territory, 760 miles south of Moscow. However, until a dock for it has been completed, the new submarine will be carrying out service duty in the Black Sea and will undergo maintenance at the port of Sevastopol. According to Igor Kasatonov, a former deputy commander-in-chief of the Russian Navy and former Black Sea Fleet commander, the submarine is capable of detecting targets at a distance three to four times in excess of the capabilities of enemy radar systems. “The capabilities of these new submarines were first demonstrated late last year when [a submarine of this project] the Rostov-na-Donu carried out a strike with Kalibr missiles against terrorist targets in Syria,” Kasatonov told RBTH. Once the Kolpino comes into service, the Russian Black Sea Fleet will have completed the formation a full-fledged submarine brigade based in Novorossiysk. By 2020, six similar submarines will be built for the Pacific Fleet too, said Kasatonov. Why set up a new naval base? Initially, the new base in Novorossiysk, on the Black Sea coast, was set up because of disagreements in Russian-Ukrainian relations after the breakup of the Soviet Union. After 1991, the naval base in the Crimean port of Sevastopol, part of newly independent Ukraine, was leased to Moscow, though any upgrade of the fleet (up to the very last cartridge) had to be agreed with the Ukrainian parliament. After Russia’s seizure of the peninsula in 2014, a large-scale upgrade of the Russian Black Sea Fleet began. “Sevastopol Bay creates unique opportunities for Moscow. Together with the new base in Novorossiysk, Russia can fully control the Bosphorus, the military infrastructure in Bulgaria and can neutralize the threat posed by the U.S. missile defense base in Romania,” TASS military observer Viktor Litovkin told RBTH. Alexander Khramchikhin, head of the Institute of Political and Military Analysis, a Moscow-based independent research body, explained that the key threat that the American ABM system in Eastern Europe poses for Russia is that the U.S. bases can in an instant be converted from defensive into offensive ones. “It is possible to develop the U.S. missile defense system and deploy cruise missiles in launch silos. In particular, launchers for Standard SM-3 interceptor missiles can be used to carry out strikes with Tomahawk strategic cruise missiles against targets on Russian territory,” said Khramchikhin. A significant benefit offered by the new base of the Russian Black Sea fleet is that it makes it possible to divide ships and submarines between several naval bases in the same region, say experts. However, the Novorossiysk base is very susceptible to local weather conditions. “The coast in Novorossiysk is regularly affected by powerful northern winds coming from the Caucasus, which hit ships and houses in their path. The wind can throw ships ashore and destroy the whole military infrastructure,” Viktor Litovkin told RBTH. “From the start, the base was built in such a way so that blasts of the wind could not be so destructive,” he said, adding that Russia was building an additional tunnel in the Caucasus to eliminate the threat posed by destructive winds. Surface speed – over 17 knots (31.4 km per hour);Underwater speed — 20 knots (37 km per hour);Cruising capacity — 45 days;Crew — 52;Surface displacement – 2,350 tons; displacement when submerged — 3,950 tons;Length — 73.8 meters;Width — 9.9 meters;Draft — 6.2 meters.Operational depth — 240 meters, maximum depth — 300 meters.Armaments:- 4 cruise missiles of the Kalibr-PL class;- 6 torpedo tubes of 533 mm caliber;Total ammunition — 18 torpedoes and 24 mines.